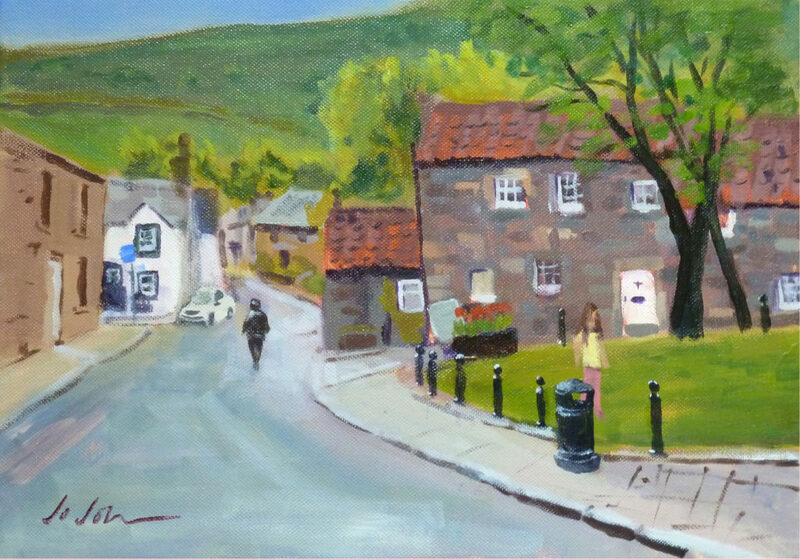 I started painting this “in situ” in Falkland but my first “go” at it did not ‘go’ at all well, so I scrubbed it off, took a photo, packed up my easel and came home with my tail between my legs! Next day, I started off this version in the studio working from the photo. Yes, it was certainly easier working in the studio with no cold or wind to bother me and no curious passers-by making me feel self-conscious (!) but – somehow I missed the immediacy and raw emotion of painting ‘en plain air’. It’s been a long time since I ventured outdoors with paint and canvas and I realised that I’ve become a bit too used to the more contemplative and leisurely approach that painting indoors encourages. When you’re out in the open, with your packed lunch in your pocket, you know you’ve only a short time to capture the essence of the scene in front of you and that tends to sharpen your focus and is altogether a more demanding activity – and it requires your mind to be fresh and sharp too. If I’m in any way sub-par, e.g, not having slept well the night before – as was the case that day – then I find it much harder to produce work of the quality I’m aiming for. But then I’m always striving for the unattainable, so having an off day makes that goal even further out of reach! All part of the learning experience.